"I wanted you to know Tyler had an amazing experience! He came home raving about how much fun it was and couldn't quick talking about it. Thanks to all involved!" "Stephen was top notch and all the kids had a blast! Entertaining and educational." "Super fun. Even my husband and I learned something." "What a unique birthday party. The kids loved it!" "Scott was wonderful. The children and adults were all entertained. Thank you!" "Best party we've had for our son. Loved, loved, loved it. Can't wait to do it for my daughter's birthday." 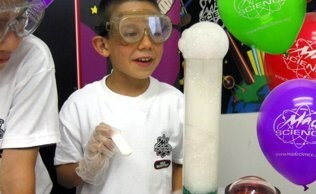 "My son and his friends loved the Mad Science Party. It was his best ever. Hannah was great with booking and answering questions. We're thinking of doing it again with our Girl Scout Troop." "The kids had a great time! Eric, the Mad Scientist, was awesome!" "Excellent job. I've already referred Mad Science to others." "Stephen was awesome. The kids (14 kids) 4-7 year-olds were engaged the whole time. I would recommend this party. This was a great experience." "Everyone had fun. The Mad Scientist kept the attention of a 2-year-old up to an 85-year-old." "Went well beyond expectations. Kids were thrilled." "Stephen was fantastic. He clearly had done these experiments before, but still showed a ton of enthusiasm." "Kept a pack of 9-year-old boys completely fascinated. Great fun!" "I have already passed your name to two parents of my party goers. Super awesome experience." "What a blast! Stephen kept all of the kids interested - even Chase's 5-year-old little brother. Now Chase wants a Mad Science Party for his next birthday! Do you have other parties? Thanks for a great day." "Wow. The Mad Scientist captivated the kids. Amazing." "Easy to book. Kids loved it. It was a hit. Absolutely fantastic. Eric was entertaining and enthralling. Thanks! It was perfect." "Stephen held the attention of 12-year-old boys for over an hour. They were fascinated yelling, "Do it again! Do it again!" I highly recommend this program. "Awesome. The perfect party for our 6-year-olds." "Great event. Kids and parents enjoyed it. I would recommend it to others. What an easy party to host." "This was the best party ever. Everyone enjoyed it. Kids and adults." If you have comments or suggestions, please let us know by writing mailto:mail@madsciencemn.org!